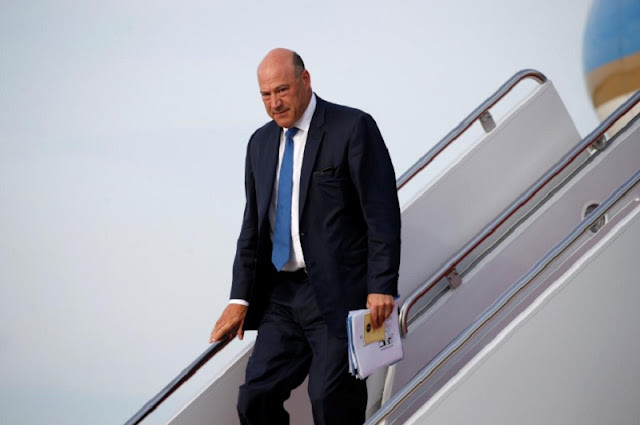 FILE PHOTO: Gary Cohn, U.S. President Donald Trump's top economic adviser, steps from Air Force One at Joint Base Andrews in Maryland, U.S., August 30, 2017. NEW YORK - President Donald Trump’s top economic adviser said at the United Nations on Monday that the United States stands by its plans to abandon the Paris climate pact without a renegotiation favorable to Washington, a step for which the international community has little appetite. Trump in June announced his decision to withdraw the United States from the Paris agreement, saying it would harm U.S. industries, cost U.S. jobs, weaken American national sovereignty and put the country at a permanent disadvantage to other nations. “We made the president’s position unambiguous, to where the president stands, where the administration stands on Paris,” Gary Cohn, director of the White House National Economic Council, told reporters after an informal breakfast meeting with ministers from about a dozen countries on the sidelines of the annual gathering of world leaders at the United Nations. U.S. officials attended a Montreal meeting on Saturday of ministers from more than 30 of the nations that signed the climate change agreement. The Wall Street Journal reported that Trump administration officials had said Washington would not pull out of the agreement and had offered to re-engage. “There was some confusion over the weekend and I think we removed all the confusion,” Cohn said, referring to the Montreal meeting. Cohn, who is overseeing the issue for Trump, on Monday declined to elaborate on suitable terms that the United States would consider to remain in the accord. It takes four years for a country to withdraw from the Paris agreement, so the United States will be a party to it until two days after Trump’s first term ends, if it follows through on the pullout. His planned withdrawal, part of the Republican president’s nationalist “America First” message, drove another wedge between the United States and some of its closest allies. His Democratic predecessor, Barack Obama, was instrumental in brokering the deal intended to address one of the leading global concerns of the 21st century. Trump in the past has described climate change as a hoax. Cohn has been part of the “stay-in” accord camp among Trump’s advisers, which also included Trump’s daughter Ivanka and son-in-law, Jared Kushner. Trump’s former chief strategist Steve Bannon was one of the main opponents of the accord before leaving the White House last month. “We’ve taken note of President Trump’s statements to not respect it, but for the moment no acts have been put into force and we have to hope that we can convince him to change his mind,” foreign minister Jean-Yves Le Drian told reporters in New York. “To convince him, international pressure must be strong, but we will not stop the implementation of the Paris accord,” he added. The climate accord, reached by nearly 200 countries in 2015, was meant to limit global warming to 2 degrees Celsius (3.6 degrees Fahrenheit) or less by 2100, mainly through pledges to cut carbon dioxide and other emissions from the burning of fossil fuels. U.S. allies have been vocal on its importance. A European official at the breakfast told Reuters Cohn made the same points on the U.S. position that he made publicly but with a more positive, open tone. The official said while the United States could remain in it under the right conditions, those were not there yet. President Donald Trump’s top economic adviser said at the United Nations on Monday that the United States stands by its plans to abandon the Paris climate pact without a renegotiation favorable to Washington, a step for which the international community has little appetite.